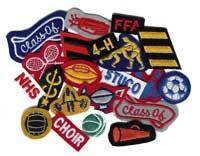 Embroidered swiss inserts can be added to patches, varsity letters, or other custom chenille products to show your accomplishments and activities. We can match virtually any color or request and you can fit several of these beautiful additions to each product. Of course, if you already have your letters or patches, you can still order your swiss inserts from us and we'll ship them loose so you can have a local seamstress sew them onto your varsity jacket! It's just one more great product we make available to our customers.